This afternoon, I went with my family to an apple orchard to pick fresh, local produce to enjoy. It felt organic. Not in the “lacking chemicals and pesticides” way, but in the “feeling connected to the earth and supporting something good”. My kids loved picking the fruit and sampling all the different kinds of apples. I am eager to make my escalloped apples recipe as soon as possible. But the best part of the day was coming home to dinner already made and a very hungry family to feed! 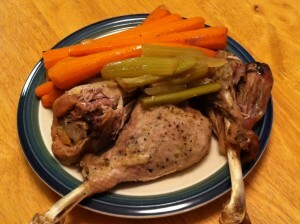 One of my favorite meals to cook and eat is pot roast– meat, potatoes, carrots, celery, onions… all the basics. It’s so filling and full of great nutrients. One crock pot is a whole meal. But sometimes I like to vary it up a little. 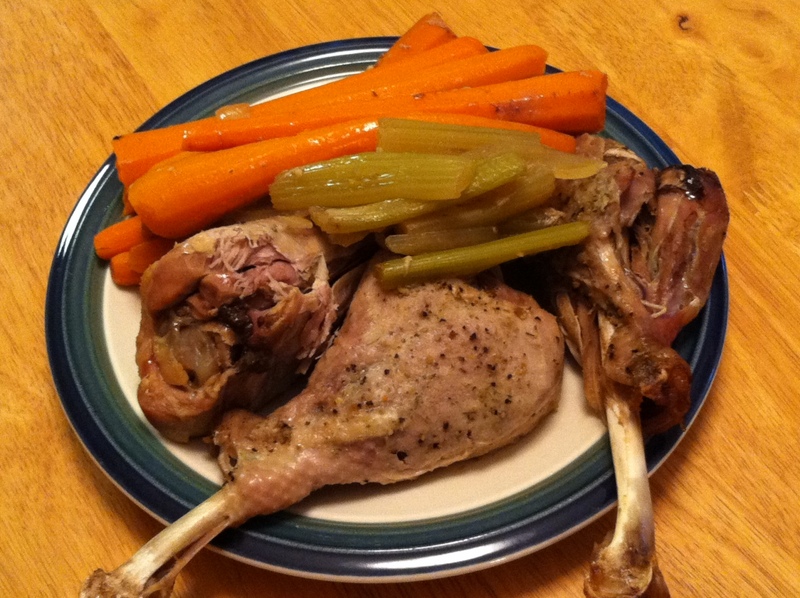 I made a very similar recipe today, but instead of beef, I used three turkey legs as our protein. The meat becomes so tender it falls off the bone. I used whole carrots because they make such a nice presentation and they don’t get soggy when they cook. The key to keeping the meat tender is to use the meat rack for the crock pot and keep it elevated. It still absorbs all the flavors as it cooks, but it doesn’t deteriorate as it cooks. I highly recommend making this dish for a family dinner or even for the holidays! Trust me– I’m sure you can think of 100 other ways to spend a weekend afternoon than staying in the kitchen cooking. Get out there and enjoy life a little, then come home for a great meal. Enjoy! Put all produce (carrots, onions, celery, potato) in crock pot and arrange in bottom. Using an oval shaped crock pot is best. Put crock pot meat rack in so that the meat will sit just above the produce. Pour chicken broth in, but do not let the volume of it reach the meat rack. Place turkey legs on meat rack. Brush meat with olive oil and then sprinkle with seasonings. Cook on low for 6 hours. This one looks so good! Will have to give it a try.